What does it mean to “Grow” as people who are committed to supporting others to grow? How is our emotional intelligence, globally, supporting and inhibiting growth? New research findings suggest that our global levels of EQ may fuel challenges, we also seem to be set up (on average) for growth. Which begs an essential question: In what conditions do we grow best? Growing on the Inside: Who Do You Want to Be Next? For many people, as that process of physical “growth on the outside” slows, so does “growth on the inside.” Yet one of our greatest gifts is the capacity to nourish the possibilities within, overcome inertia, and develop ourselves. For yourself, today, what is one quality you’d like to be able to write in that ___? Caring, self-compassionate? Responsible, patient? Wise, hardworking, relaxed, focused? Energized, calm? Self-disciplined, playful? How will you know this growth is occurring? What’s fueling that desire – is it because you’re suffering without it, or is it sprouting from your own flourishing? Is it something you want, or something you “should” do, or perhaps both? And, from were will it arise? Are those qualities already inside you – or must they come from the outside? This calendar quarter, October through December 2018, we’ll explore these questions and the science and practice of growing “on the inside” as individuals — and also as teams and organizations. 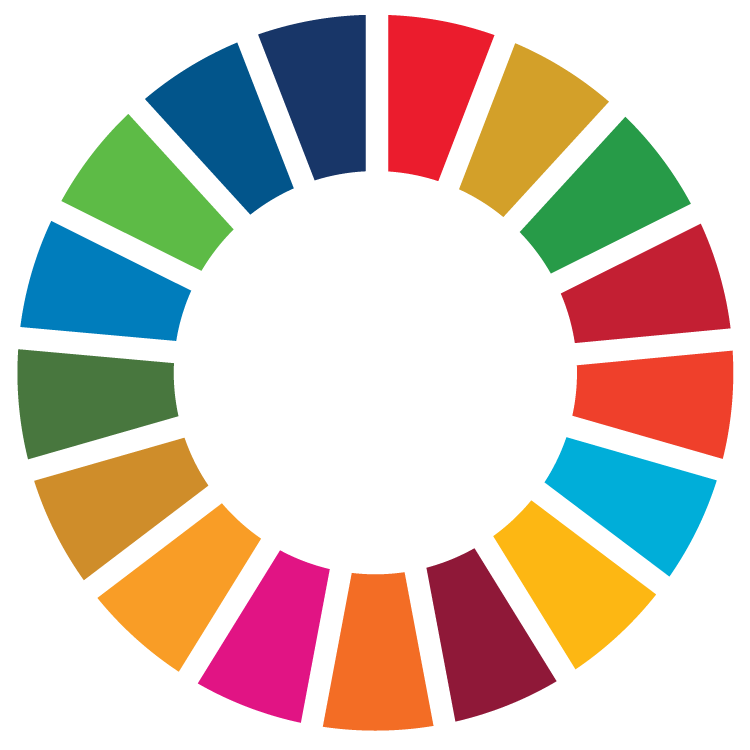 As a United Nations Action Partner, last week we honored the Global Day of Action for the Sustainable Development Goals. How will humanity rise to meet these audacious, urgent needs (such as eliminating hunger and ending violence against children)? Is it enough for politicians to pass a law? The Convention on the Rights of the Child was passed 29 years ago; among other rights, it outlawed violence against children, and all world nations but two signed on. Yet three decades later, according to a 2016 study on violence against children, published in Pediatrics, over half of the world’s children (1 billion children, ages 2-17) suffer from violence. At least in this tragic case, laws are not enough. Laws are a kind of “growing on the outside.” What do we need to “grow on the inside” to change this story? One answer is emotional intelligence: The capacity to align our feelings, thoughts and actions for mutual good. When people develop greater EQ skills, they’re able to solve problems proactively and effectively, communicate about differences, and make better decisions.  The power of EQ for harnessing human power for positive change is why we’re holding the POP-UP Festival, the largest EQ event in history supporting UNICEF’s mission for safety and wellbeing for every child. This quarter’s EQ Café (a free event for practicing EQ, held by our volunteer leaders in 200+ cities around the world each quarter) will also follow these themes. Watch this schedule of EQ Cafés to see if one is coming to a city near you. Six Seconds is now 21 years old. Somewhere near the start, Anabel Jensen, Six Seconds’ Founding President, and I were talking about what’s needed to address the world’s challenges and her simple answer: We need more changemakers. Another “Anabel-ism” is: “We teach what we are, and we are what we teach.” So, to become changemakers for a more emotionally intelligent world, we need to grow our own emotional intelligence. All change starts from the inside. So… whatever we want more of, or less of, in the world… can we make it so inside ourselves? We started Six Seconds in order to answer the question: “How do you teach EQ?” Through decades of research and practice, we’ve developed a range of tools and a systemic methodology for this, but, at the core, the answer is: By practicing it ourselves. This is, at its center, Six Seconds’ strategy and our purpose: We engage and support people to practice emotional intelligence in a way that supports and engages people to practice emotional intelligence. Next month, we meet for our seventh EQ Master Class, our occasional gathering of Six Seconds’ EQ changemakers who’ve built their businesses and lives around this mission. 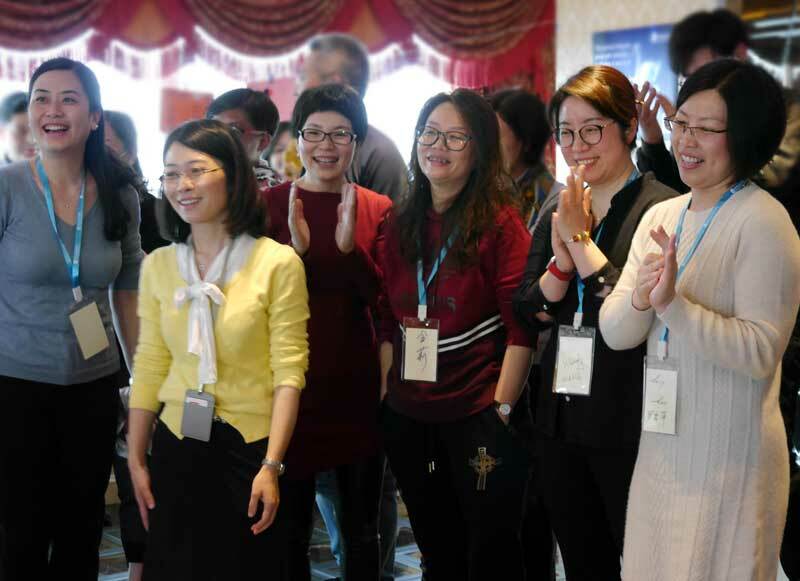 Like all our learning programs, Master Class isn’t really a class… it’s a six month program for growing capacity: Growing the capabilities we can see on the outside, and growing the strength on the inside to support and sustain this work. 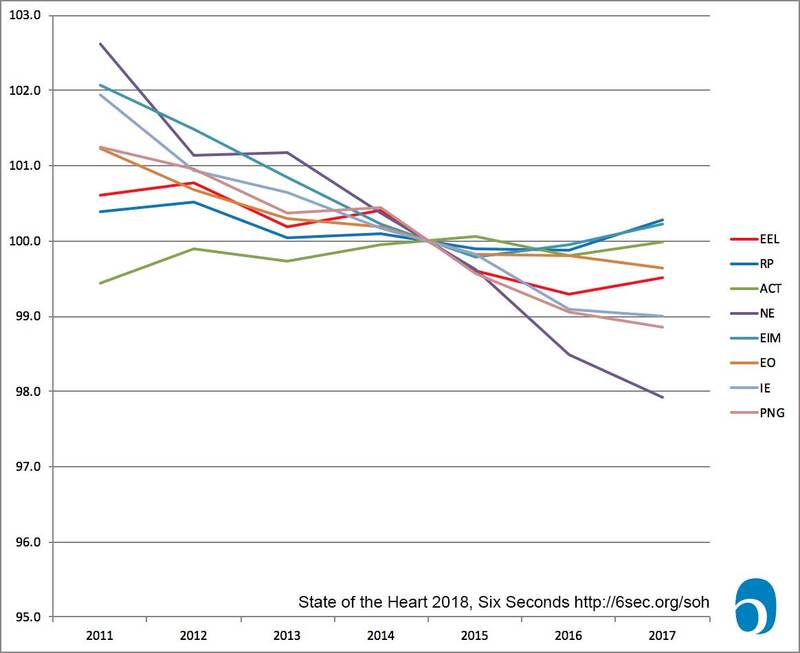 Over the course of the year we’ve been sharing findings from the world’s largest study on emotional intelligence (EQ), The State of the Heart. The study is based on a random sampling from a database that now includes over 200,000 people in 160 countries. We’ve mentioned that since 2011, overall EQ has declined – but recently, the trend has changed, and overall EQ is no longer declining. 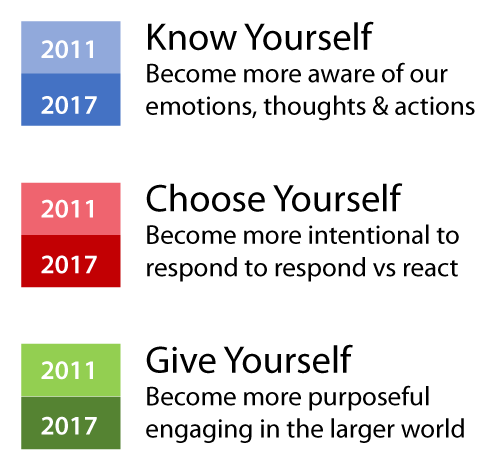 To interpret this graph, we could consider the world as a person: In this time, they’ve become slightly less self-aware (blue), considerably less able to self-manage (red), and showing far less self-direction (green). One of the competencies with the largest declines is Navigate Emotions, which means they’ve become more volatile and emotionally reactive. Another decline is in Increase Empathy, which means they’ve become less emotionally connected — more isolated. 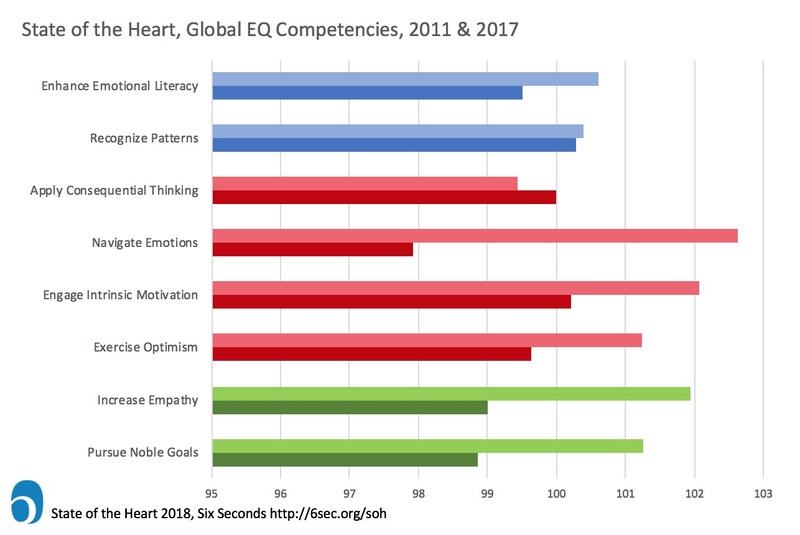 We can infer this “global citizen” is making analytical decisions, and perhaps leaving out emotions (since, in 2017, the analytical skills of Recognize Patterns and Apply Consequential Thinking are higher than the emotion-related skills of Enhance Emotional Literacy and Increase Empathy). Their decisions may be tied to a growing perception of risk/threat (indicated by declining optimism). Together with the increased perception of threat or risk, the increase in Apply Consequential Thinking suggests this “average person” is more able to pause and assess the risks before moving forward. The fact that emotional literacy and empathy are higher than Navigate Emotions could mean that while the emotional data is visible, it’s overwhelming. This “person” has a lot of energy (Engage Intrinsic Motivation and Exercise Optimism) and is not sure where to apply that for the long-term (lower Pursue Noble Goals). So in addition to the reduced emotional connection, they’re less able to connect with their own sense of purpose. That’s all fairly alarming. However, it’s not all bad news. Insight from the world’s largest study on emotional intelligence: Navigate Emotions is the skill with the greatest decline since 2011. It means, on average, people are more emotionally volatile and fragile. Does this match the headlines? We can see that while some EQ skills have continued to decline, others are more stable — and some are now increasing. From 2016 to 2017, half the competencies actually increased (EEL, RP, ACT, EIM). This reflects a growing awareness (emotional + rational), a growing ability to pause and assess, and an increasing energy for change. What if we all could be more aware, take those all-important pauses to assess — and we had more energy to step forward, fueled from the inside? That sounds like a recipe for growth! Continuing on this theme of Engage Intrinsic Motivation: Where is the source of energy for growth? On the other hand, sometimes we grow because it’s our nature to do so. Seeking sunlight, the acorn turns into an oak. It may be that striving actually blocks change, and compassionate acceptance is the soil in which deep change takes root. In my own story of childhood struggles and growth, I realized sometimes growth is less about “achieving,” and more akin to “unfolding.” What’s your experience of the conditions for growth? Is suffering enough? Or must that suffering be set in a context where it’s catalyzed into something new? Finally, three more quotes about growth — which one speaks to you about your own growth? Share your comments below. Seeking sunlight, the acorn turns into an oak. It may be that striving actually blocks change, and compassionate acceptance is the soil in which deep change takes root. Thanks Josh. A timely reminder and very relevant theme for the current times: Apparently, there’s less focus on growing from inside in the fast-pace world of today. And without self-awareness we get stalled. With declining IE & PNG, we probably are too much focused on here-n-now that we tend to forget what we truly want and what brought us here. Working hard is good but without any sense of direction perhaps we might end up at the wrong place…not what we truly want. Growth from the inside, hence is crucial. It’s good to see that ACT has improved over the time. We know, at least, we might be paying a heavy price by focusing only on material growth at the cost of growth from the inside…developing EQ is crucial for humanity to grow in the real sense. Thank you Josh and Six Seconds team for the great insight. I think the decline in NE skills is an obvious explanation for why there seem to be a rise of extreme nationalism that leads to so much hatred, fear, and division. All the more reason why we need not just 1 billion but half of the world population to practice EQ! Thank you so much to Six Seconds team for your relentless efforts to leverage our EQ. Without it we are not able to surrender of security , accept ourselves, love ourselves and grow. When everyone will do so , what a beautiful world would be there . And thank YOU Olga for being part of this effort to bring EQ to everyone. One small step… then another! Josh your work is amazing. I did my EQ certification in South Africa and I am trying my best to practice it in our company. Your posts really helps. An inspiring article, thanks Josh. I see people low in NE resisting and blocking change often, so I’m not surprised by the result above. Your reference that striving may block change is spot on. Thank you for this thought provoking perspective.